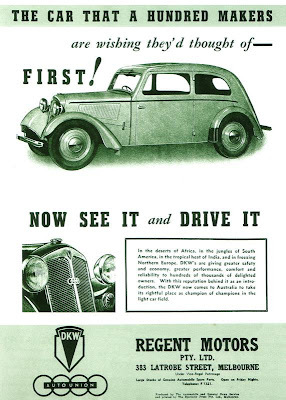 DKW cars first appeared in Australia in 1935. The first cars to arrive were wholly German built vehicles but Australia's high import duties made them uneconomical. 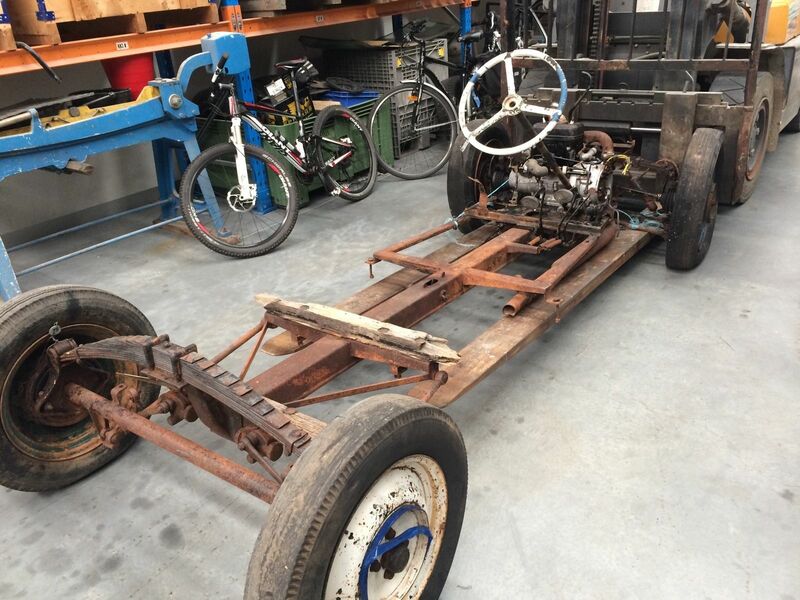 Auto-Union overcame this by negotiating with domestic body-builders to body DKW's bare chassis. Separate companies bodied DKWs in each state to a general template, but with significant local variations. These variations from the Auto-Union template became a source of dissatisfaction at company headquarters due to highly variable quality. 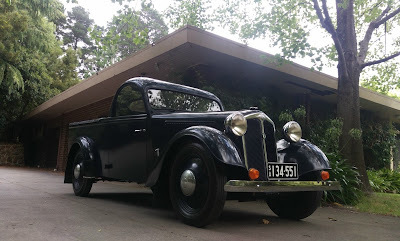 Auto-Union's records reveal that 1290 DKW cars were exported to Australia between 1935 and 1939. They sold surprisingly well, especially in the country where their robustness and minimal maintenance requirements were highly regarded. Restored Cars Magazine featured two DKWs restored by Des Fullard in their July-August 2005 edition. 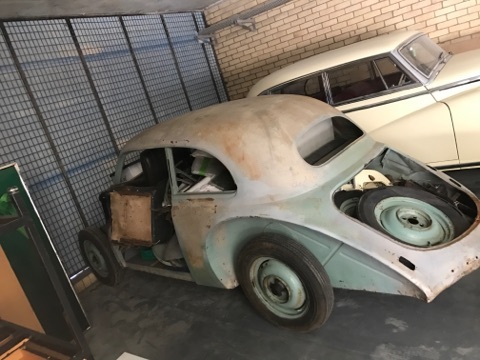 This was his very fine and original condition F5, certainly one of the earliest surviving DKW's in Australia and possibly one of the first batch imported by R Williams in Victoria. Graham Shipton restored this 1937 DKW F7 roadster in around 2010. The car was later sold but remains in South Australia. 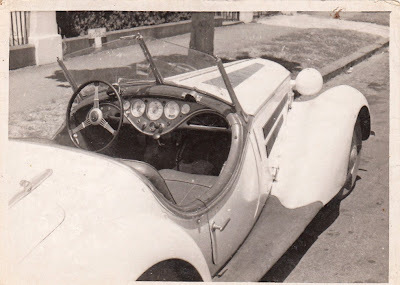 At the end of his roadster project (above) Graham had enough spare parts to build this custom racer using a shortened F7 chassis, standard 688cc two cylinder two-stroke engine and a custom aluminum body. Graham continues to race the car regularly at the Winton Classic races in Queensland. This chassis, engine and assorted panels was posted for sale on eBay in late 2015. It had been recovered by the seller's father in rural Victoria some 20 years earlier but he never got around to restoring it. Its current whereabouts are unknown. This roadster bodied F7 has recently been discovered. This 1937 DKW F7 has spent its entire life with one Perth family. It was purchased in Busselton in 1939 and still has its original order paperwork. 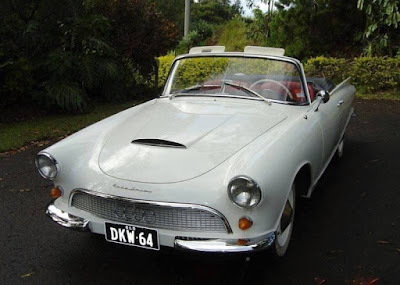 The original selling agent was Auto Union DKW Sales Ltd, 442 Murray Street, Perth. This company was formed in 1938 and wound up in 1942 by which time the remaining stock of DKWs would have been cleared. Contemporary photo of the car shortly after its original purchase. 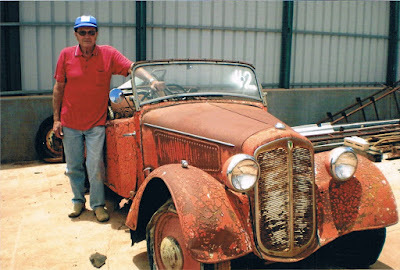 DKW enthusiasts, Paul and Jill W found this DKW roadster in country South Australia several years ago. Restoration was finally completed in mid-2016 and the car debuted at the Bay to Birdwood. It has also been featured in Restored Cars Magazine. This roadster was recently for sale in Just Cars. Current status and location unknown. This DKW F7 is owned by one of the members of the Historic German Vehicle Register (formerly the DKW Club of Australia) and is regularly used at club events in Melbourne. This DKW F7 roadster is being restored in Darwin. The owner intends to install a German built wood and faux-leather body supplied by a German DKW restorer. 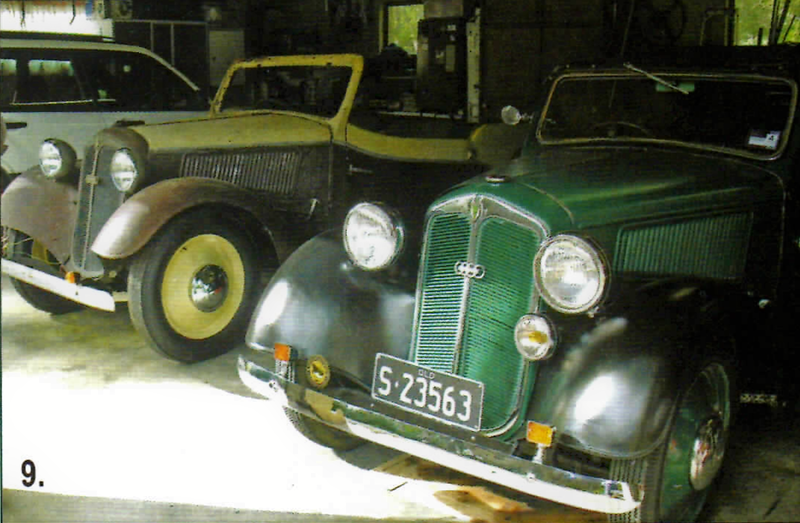 These two 1937 DKW F7's were featured in the May-June 2016 Restored Cars magazine #236. This car was sold in 2017 and is now in South Australia. These two DKWs under a lean-to in South Australia appeared for sale on eBay in 2012. 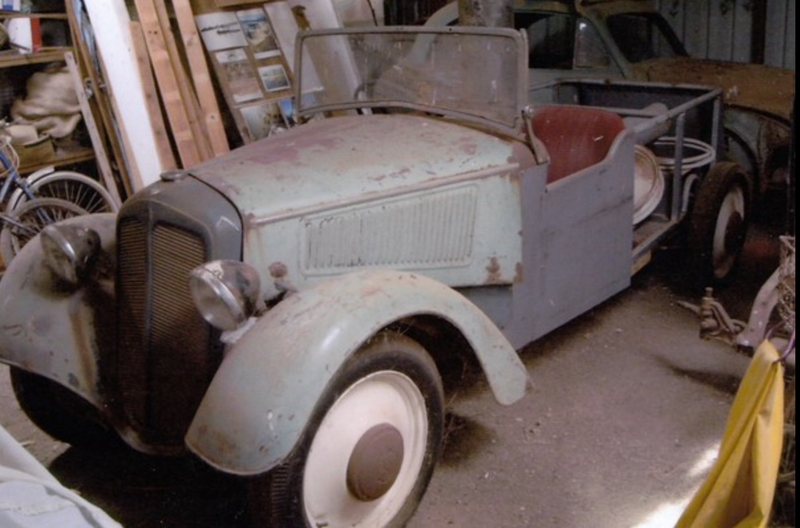 The seller intended to sell the sedan and restore the roadster themselves. I don't believe the cars sold at that time and their current whereabouts are unknown. This South Australian bodied F7 come up for sale in October 2017. It was advertised on Gumtree for only a few weeks before it was sold. Who purchased it? 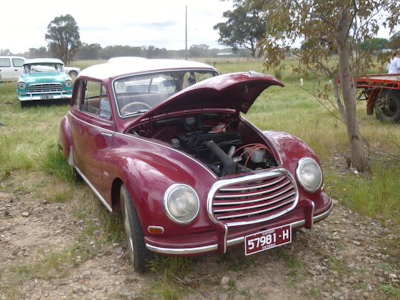 This DKW F7 was given a utility body by coachbuilders J.A Lawton and Sons in South Australia. It was restored in South Australia some time ago but now resides in Victoria. 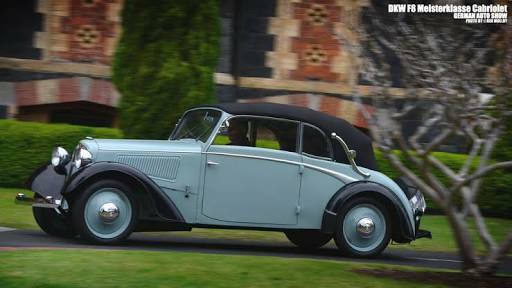 This wonderfully restored DKW F7 with canvas soft-top is possibly one of the last pre-war DKWs to arrive in Australia. 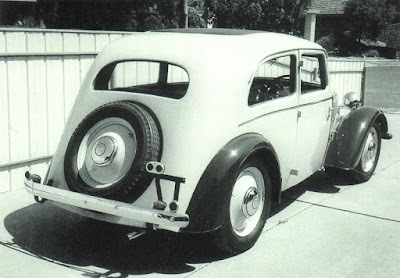 The story is that a shipment of DKW rolling chassis arrived in Port Adelaide in 1939 shortly after the outbreak of the Second World War. The stevedores refused to unload the German cars so they were carried on to Fremantle in Western Australia. The Fremantle stevedores were not so fussy and the cars were offloaded and handed over to a local coachwork firm called Boltons. 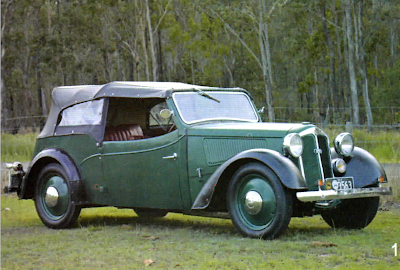 They installed steel bodies on the cars which were quite different in detail from the bodies manufactured by the official Australian coach builders. This DKW F7 was given a utility body by dealers and coach-builders Kellow-Falkiner of Melbourne. This sunroof sedan was also bodied by Kellow-Falkiner in Melbourne. Despite being mislabled as an F8 Meisterklasse, this is an F7 with an Adelaide built body. It is owned by a member of the Historic German Vehicle Register and was photographed at the German Auto Show in Melbourne in 2016. This special was constructed from parts with improvements for racing. A rarity imported during the post war years. This was car was owned by the late Arthur Clisby, enthusiast and Bay to Birdwood stalwart for many decades. If the surviving pre-war DKWs tell us anything then it is that the roadster body was the most popular seller in Australia. These roadster bodies substantially differed from the German roadster version and were more similar to contemporary MG bodies. 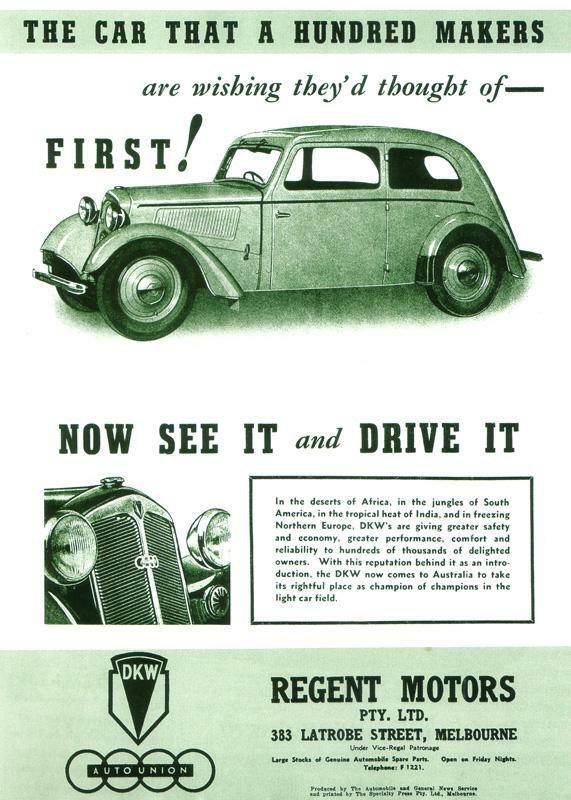 After the war there were high hopes that DKW would return to Australia, however, DKW were not in a position to begin exporting until after 1953. Regent Motors, DKW's primary agent in Australia, imported five 1951 DKW F89P sedans which they exhibited at the 1953 Melbourne Motor Show. Further sales however were not forthcoming due to import duties. A small number of Schnellaster commercial vans were however sold. 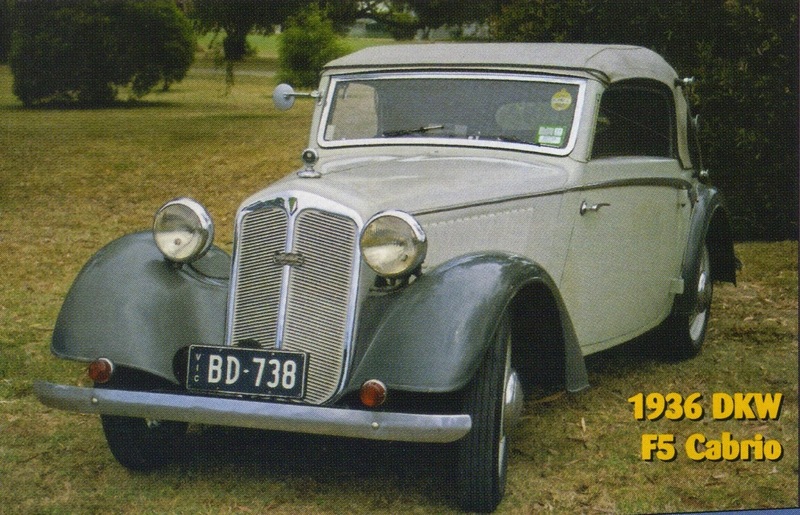 Five years later Standard Motors of Victoria, another of DKWs pre-war agents, imported 9 DKW F93s and an Auto Union 1000s, but by this stage Volkswagen had established themselves in Australia and were dominating the small car market. Standard's cars did not sell, pretty much bringing to an end Auto Union's attempt to re-enter the Australian market. 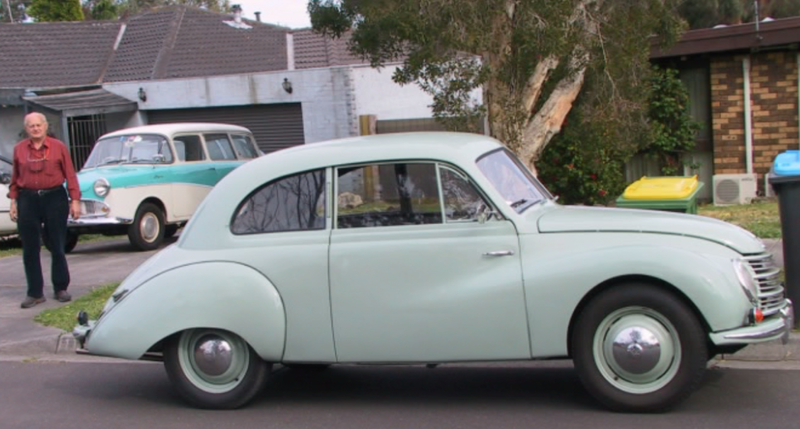 This very early 1951 DKW F89P coupe was possibly the DKW displayed at the 1951 Melbourne Motor Show and is the probably the oldest post-war DKW in Australia. 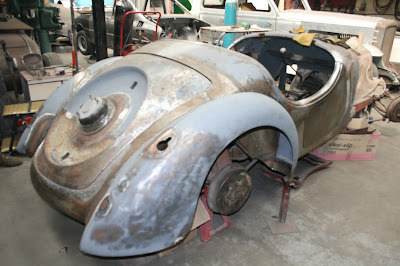 The car was featured in the Restored Cars article about Des Fullard's DKW collection mentioned at the top of the page. Unfortunately the car was left to deteriorate after Des' passing. It passed through several hands but is now being restored in Queensland. 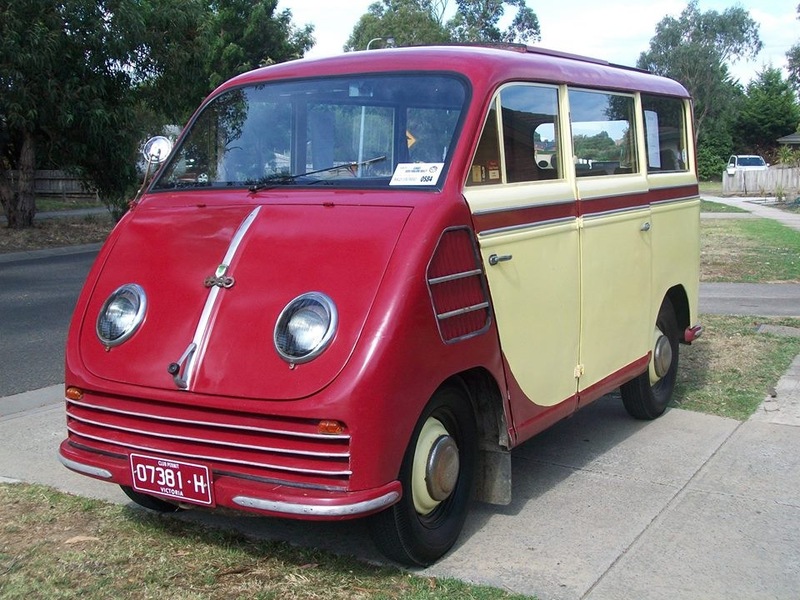 This 8-seater bus was restored by 'Mr DKW' Bill Dean. It spent many years with the Dean family after Bill passed but has recently changed hands several times. 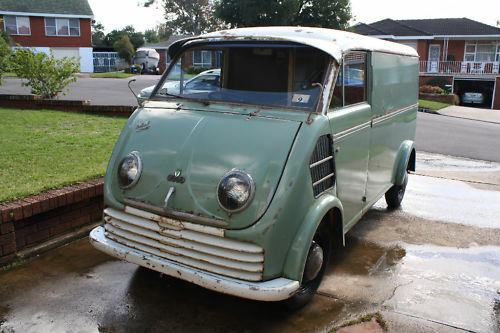 This very early DKW Schnellaster was part of a consignment of DKW vans purchased by Carpet Care. They were used as part of a corporate fleet for only about five or six years before they were replaced with more powerful vehicles. This, the only survivor, was found on a farm in Gippsland and restored by Ross Noble. 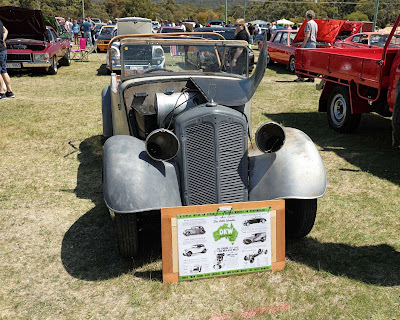 For many years the car was on display at the Maffra Transport Museum. This 1953 DKW F89P export-model was imported from Portugal and is now being slowly restored. 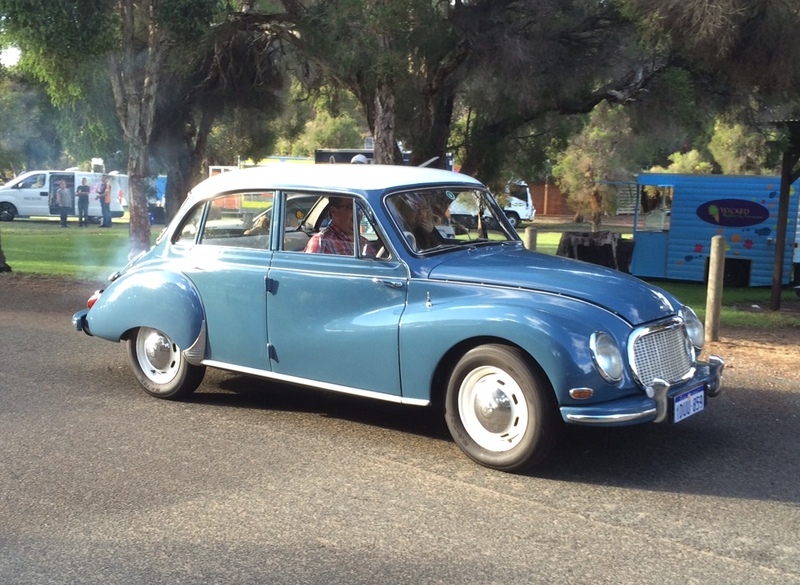 This DKW on club plates was spotted in Muckleford, Victoria. Who owns it? By its radiator grill screen it looks like F93 Sonderklasse, the successor of the F91. DKW would shortly thereafter drop the Sonderklasse moniker. This 1957 F93 is a recent import from South Africa. 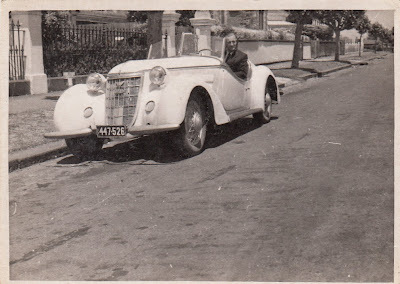 This car was part of the well known horde of European cars from country NSW. After changing hands several times recently the car is now being restored by Craig S in Sydney. This car was one of the original ten imported by Standard Motors in 1959 to test the market. None of the cars sold and all were eventually abandoned. The car was restored in the 1980s. Jill and Paul of Adelaide's other DKW is this 1958 F93. This car was restored ten years ago and has since done 20,000 kilometers without missing a beat. 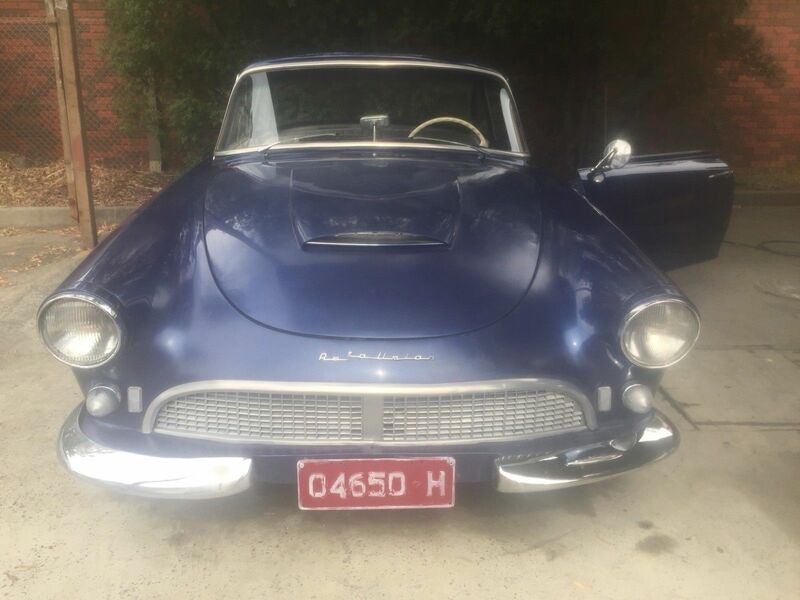 This Universal, until recently languishing in country NSW, has been salvaged by Murray of Garagista in Geelong (along with a sweet Saab 96 stroker). I look forward to hearing more about the restoration. My car, a rare four door sedan imported from South Africa. 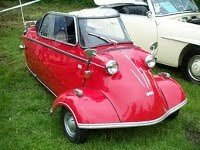 This Auto-Union 1000 with panoramic wrap around windscreen was an import from South Africa. 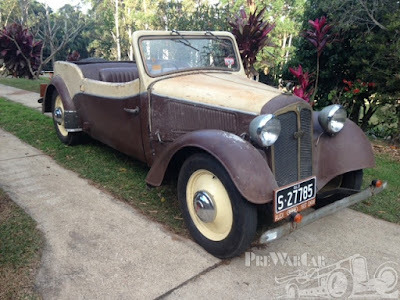 It was in Queensland but has changed hands several times since the original owner passed away. 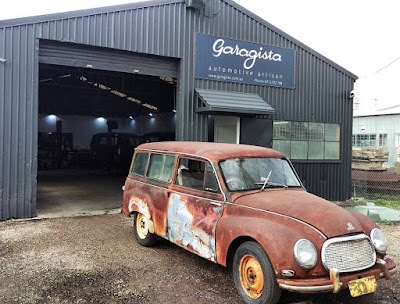 It's now under restoration with an enthusiast in Victoria. 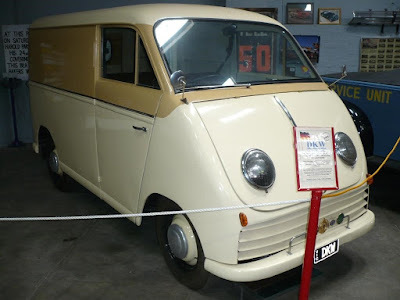 This 3=6 engined Schnellaster sat at the Melbourne Bus Museum for many years before it was eventually sold. It has apparently passed through several hands since and its current whereabouts and condition is unknown. This rare factory right-hand drive Saxomat Universal was also part of the NSW horde. 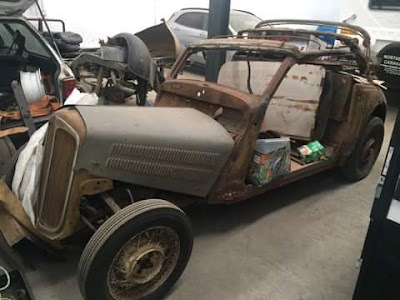 It has been salvaged and is currently stored awaiting restoration. This rare DKW 1000SP coupe is another single family vehicle. 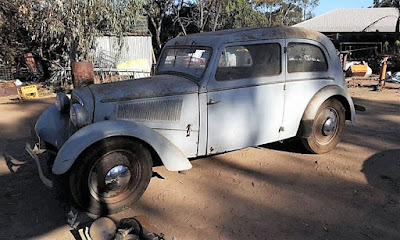 It was purchased by the current owner's grandfather new in Germany and driven in Europe until the family migrated to Australia. It was licensed until the mid-1990s before being parked away. 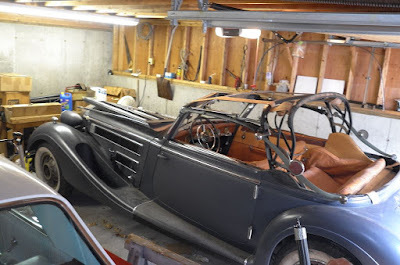 It's now undergoing restoration to get it back on the road. 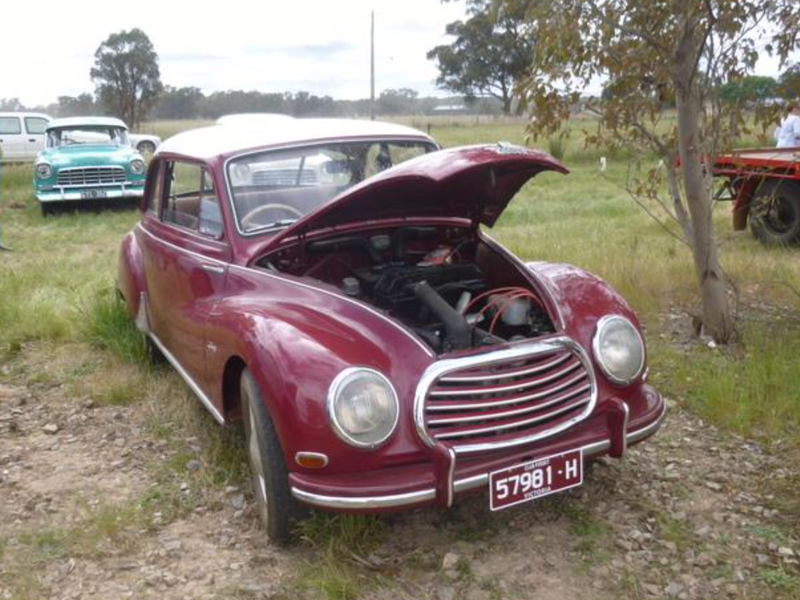 This DKW Junior was part of the NSW European car horde. I believe it has been taken but do not know its current condition or whereabouts. 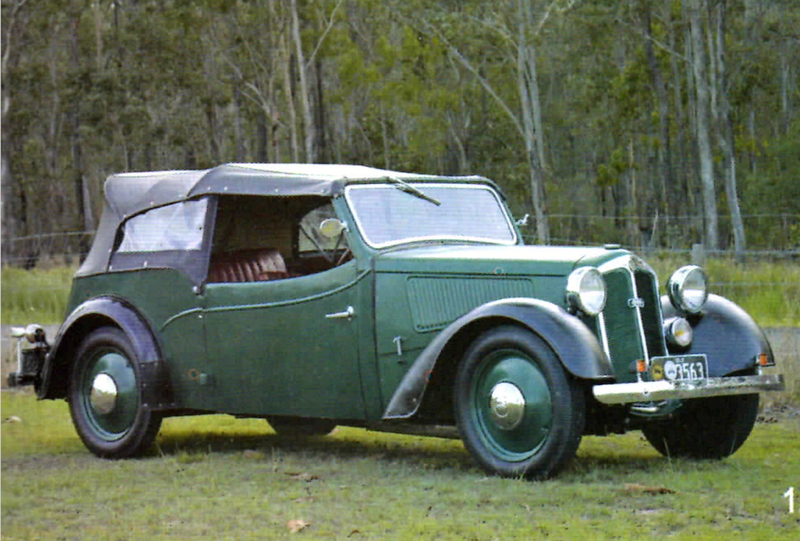 Very few Wanderer cars were shipped to Australia but at least two are known. Twelve Wanderer W6s were imported into Melbourne Australia in 1924 by the Wagner brothers. One car was used for sprints and racing as demo car, but sales were slow and some of the cars were never sold. The unsold cars were left in their crates in a factory till the early 1950's when the Wagner family decided to sell them. One of the cars was purchased by the Audi Museum in Germany for their collection. This car was one of the unsold Wagner Wanderers is now owned by Chris T. It was in a country museum for many years owned by Diana Davison the wife of GP driver Lex Davison. It had 149 miles on the speedo. It's had a new end plate on the water pump, oil change and tune up and runs like a dream. 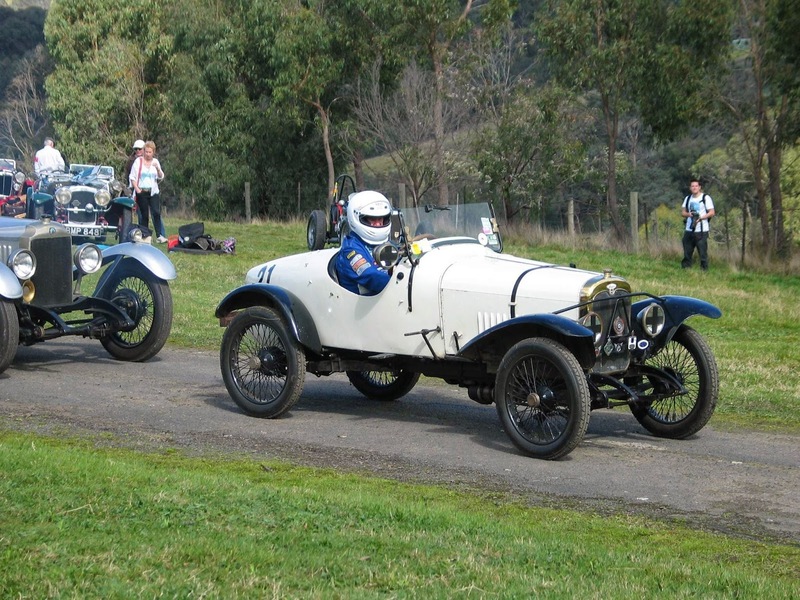 The car is the oldest unrestored Australian Grand Prix car as it was entered in the 1928 GP at Phillip Island. It is still used in vintage racing events. Peter T is the proud owner of a very rare Wanderer W35K roadster. One of a handful worldwide and probably the only one in Australia. 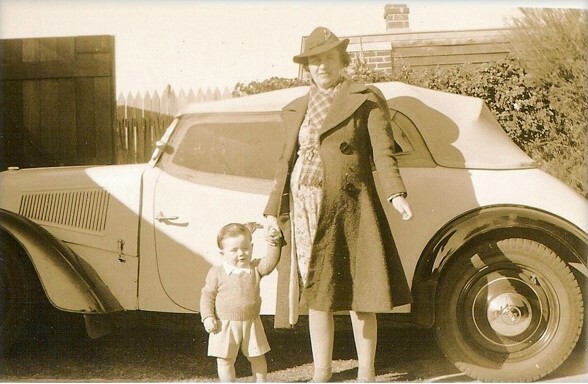 Peter advises, "The car came to Australia in the 1950’s with a migrating Dutch family. It then went to a Geelong family (I believe he ran a car repair workshop). Along the way the original engine failed and was replaced with a Vauxhall engine. It then languished in a field under a pine tree for many years before it was eventually saved by DKW club member Bill Sheehan, about 35 years ago. Bill never did anything with it however, and it further deteriorated so a couple of years ago I persuaded him to part with it. The story was the original engine had been buried along with much other mechanical stuff in the garden of the Geelong property, but the family would not let Bill go and dig it up. When I bought the car I went around to family to see if I could convince them to let me dig in their garden. When I got there the house had been demolished and the land leveled by the Ministry of housing. I paid a large bond and hired an excavator and dug a meter of soil from the whole site and found one saucepan and one boot! I was forced to search in Germany for an engine. Unfortunately, while I managed to find a correct 6 cylinder 2 litre Wanderer engine, it is not the supercharged variety, but beggars cannot be choosers." The engine is mounted in the rolling chassis. The engine was fully restored in Germany by members of the Wanderer club. http://www.wanderer-automobil-und-motorradclub.de/website/ Work on the project is progressing. 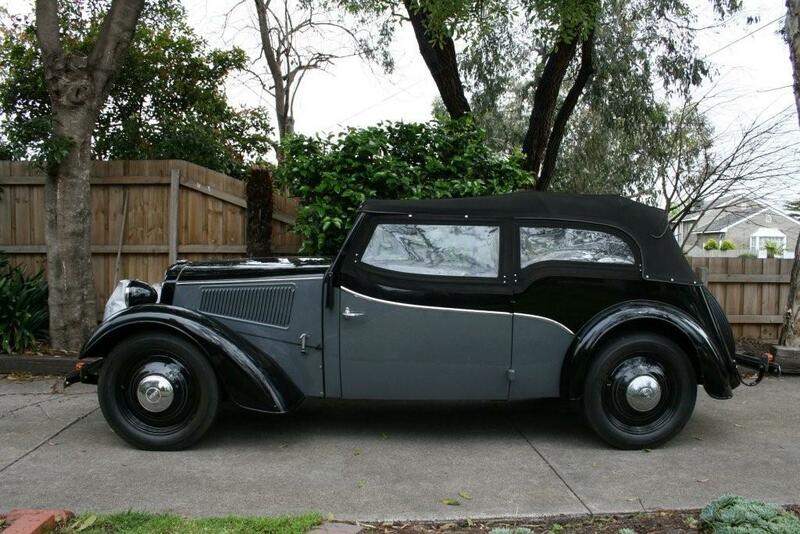 The only Horch cars to reach Australia are private imports by collectors. York Museum owner, Peter Briggs, owned a pre-Auto-Union 1932 Horch on display at his Fremantle Motor Museum in the 1990s but this was sold and taken overseas after the museum closed down. 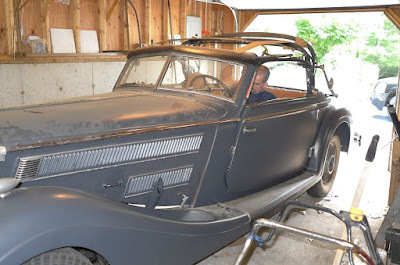 A 1935 Horch 853 cabriolet has recently arrived in Perth, where it is undergoing restoration. The car was purchased in the US. There are many more DKWs and Auto-Unions out there and if you have any info or leads I would happy to hear from you. If you are one of the new owners of any of the cars mentioned that have changed hands, I'd be pleased to hear how you are you are going and offer what help and advice I can. There is a DKW club out there in the Historic German Vehicle Register of Australia. They do internet presence at the moment but can be contacted via this link: http://siva-inc.blogspot.com.au/2017/10/the-historic-german-vehicle-register-of.html There are a small but dedicated network of fans who can assist you. 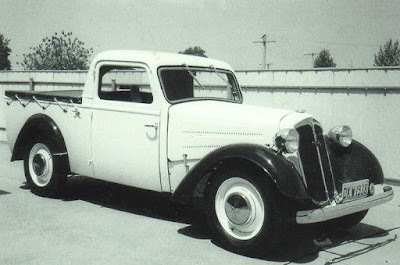 Paul Hi, David Dunn-Johnston here.I am the owner of the F89 that I am at present restoring in my double garage in our new house up the Sunshine coast in Flaxton.My new address is: 286 Flaxton Drive ,Flaxton 4560, Qld. and my home phone is 07 54786495. My email is: 46trevist@gmail.com. So far I have got the chassis done but will have to redo the engine again because of the long waiting time that it stood idle in Brisbane where I did not have the facilities to do a proper job. Anyway, the last two years have been taken up getting our new property up to scratch but now that is finally done I can get on with the restoration work in ernest. By the way there is a Swiss chap living retired up here who drives a beautifull cream 1000SP convertable which he brought over with him when he immigrated here.My mother-in-law lives in a small town called Woombye and it has an iconic pub.While driving past I spied the 1000SP parked outside and inquired who it belonged to. He gave me a tour of the car and stood me a pint and we chatted on the verandah for a while. Unfortunately I did not get his Ph # but i have been on the lookout for him as he said he lived near me.So you can add that to your list now too.!! 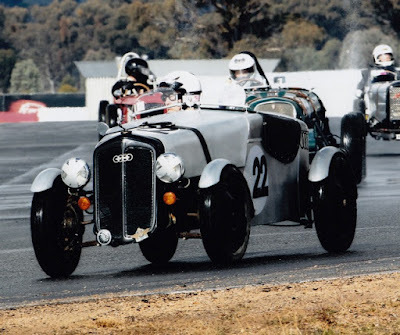 The DKW Racer was back at Winton on the weekend! It was fantastic to see on track! I am a project manager in sunny Perth, Western Australia with an unhealthy interest in vintage motor scooters, travel and ancient history. A list of some of my most highly desired vehicles... if I had the money, time and space. Ah well, you've gotta have dreams. Click on the photos to take you to a related link. "Not the Dart. They always think it's the Dart!"